For some of us, having a world-class sound system in our car is a necessity. Considering that we spend so much time in our vehicles, it makes sense that we would want an immersive listening experience. However, if you install an aftermarket system inside your car, this can put tremendous strain on the battery. As such, you may have to replace it to ensure that your sound system can operate at peak efficiency. 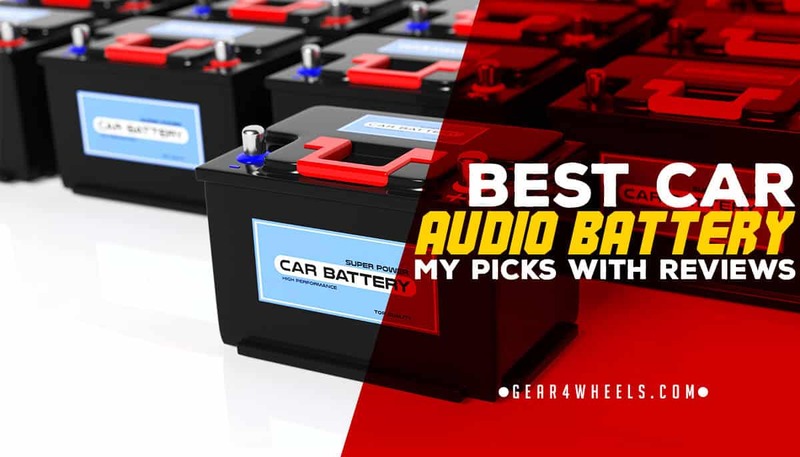 Since car audio is hugely important to me, I want to show you some of the best batteries out there for your aftermarket system. If you’re still using the battery that came with your vehicle, then you are in desperate need of an upgrade. When looking for the right battery, the most important thing to watch out for is the number of cold cranking amps (CCA) and amount of watts it can produce. It’s essential that you find a unit that matches CCA to your speakers RMS wattage to ensure proper syncing of the two. So, with that in mind, let’s take a look at what these batteries can do for you. Starting us off is this auxiliary battery from XS Power. Technically speaking, this model is designed to supplement the power provided from your current starter unit, but it can be repurposed as a replacement for your original battery. However, if you plan on doing that, you will have to buy battery terminals to make it work. Also, the starting power is not going to be as much, since this is considered a “deep cycle” model. Nonetheless, this battery is perfect for car audio. It works well for systems that use up to 3500 watts, as it can produce up to 3,300 amps. So, if you are planning on going all out with your sound system, this battery will be able to handle it all. That being said, because it’s designed for such a high output, you shouldn’t get it if you are just doing a minor upgrade. The size and cost of this battery are relatively steep when you compare it to a standard model, so I wouldn’t suggest going this route unless you need this much power. Also, keep in mind that when doing a full upgrade of your vehicle’s sound system, you have to do the “Big 3” changes. That includes replacing the alternator and upgrading the connectors as well as the capacitors. If you don’t do all of this, then your system will overload your car and cause all kinds of problems. Overall, this is a durable, high-performance battery that uses absorbed glass mat technology to provide ample electricity to any sound system. It is reliable and built to take on all comers. Next, I have another high-performance battery that can work well as an auxiliary or primary power unit for your car. As with the XS Power unit above, you will need to purchase terminals if you want to use this as a replacement for your current starter battery. Nonetheless, this model will provide more than enough electricity for most high-end sound systems. What I like about this battery is that it has a super low ESR rating, which makes it far more efficient. With deep cycle models, it’s imperative that you have as little resistance as possible so that they can recover from discharging much faster. The other thing that I appreciate about this unit is that it is sealed. This means that you can mount it anywhere and it won’t leak, and it will last much longer than traditional models. Also, since it uses absorbed glass mat technology, it’s much more efficient than a regular lead-plate battery. Finally, it is insulated against both heat and vibration. This is another reason that the battery works well in any mounted position, as you don’t have to worry about environmental damage. This also makes it an ideal choice for off-road vehicles since it can take a beating without stopping. As far as battery brands go, none are quite as well respected as Optima. The reason that these models are so incredible is the design and shape of their cells. While they are not quite as reliable as absorbed glass mat, they are almost as good, making them far superior to traditional lead plates. That being said, these models are not 100% sealed, so be careful about avoiding leaks. What I like about this battery is that it works well as a starter or a deep cycle model. While it’s not as powerful as a unit that’s designated as a “starter,” it can work on most vehicles without any problems, and you don’t need to buy any extra terminals. I also like that this model recharges fast and can be depleted over and over again without damaging the internal components. Additionally, it’s super well insulated against heat and vibration, making it ideal for most off-road vehicles. Finally, because of the way it’s designed, this battery is perfect for cold weather starts as well, which is better than most of the other batteries on this list. I’ve already shown you one of the higher end models from Kinetik, but if you aren’t planning on getting a massive sound system for your vehicle, then you will probably want something like this instead. Rather than providing up to 2400 watts for your speakers and radio, this battery can only operate up to 600 watts. This also means that you won’t necessarily have to go with a “Big Three” upgrade to ensure that your car can handle the extra power. Overall, the performance of this battery is just as good as the other Kinetic unit, but it provides less energy. It’s entirely sealed to prevent leaks, it has an ultra-low ESR rating, and it is expertly insulated against heat and vibration. You can mount this battery practically anywhere without any problems. I also like that it uses absorbed glass mat technology since that is much more reliable and durable than lead plates. Finally, this battery is much less expensive and lighter than the other units we’ve seen. So, if you just want a modest upgrade to your sound system, or you want a simple auxiliary battery to help share the load, this is a perfect addition to your vehicle. Rounding out our list is this battery model from Stinger. This unit is designed for sound systems that are a step above the baseline, but not quite at the peak level. So, if you’re looking for something moderate to high-performance, then this battery should work well for you. It’s rated to produce up to 2000 watts, but the manufacturer recommends that it be utilized for sound systems up to 1320 watts, so keep that in mind. As far as reliability goes, this unit is better than most. I like that it has absorbed glass mat technology, which means that it’s maintenance-free and completely sealed. You can mount it practically anywhere and it won’t leak, and you can also use it to replace your current starter battery. The other thing that I like about this is that you don’t need to buy terminals for it if you have ring-shaped ones, so that can save you some hassle right there. Overall, while this may not be as great as the Kinetic or XS Power Batteries, it is perfect for most moderate to low-end upgrades for your car.